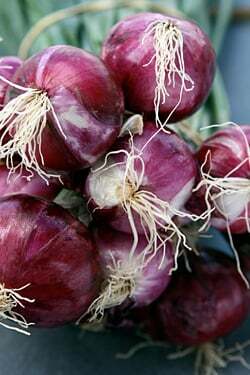 When I arrived in France a few years ago, I was a surprised to find that red onions are rare and cost nearly four-times the price of yellow onions. I reasoned that although French cuisine uses lots of onions, most often they’re cooked to enhance their sweetness, and they become an essential backdrop for braises, stews, and casseroles…and most-notably in French Onion Soup. So why use the red ones if they’re going to get lost? The rose-colored onions of Roscoff, a small port village off the north coast of Brittany, which faces England, are considered a delicacy in France. Beginning back in 1828, French farmers would load up boats with these pink onions to sell them from their bicycles in England, where the farmers were affectionately dubbed “Johnnies” by the Brits. 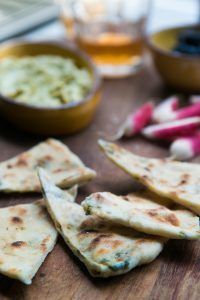 This recipe comes from one of my favorite books, The Zuni Café Cookbook (which everyone should own). Like all of chef Judy Rodger’s recipes, this one is a winner. The onions are tangy and sweet, and keep their nice crunch. They’re perfect on hamburgers and Mexican food, as well as a nice condiment for any sandwich. It’s a few steps, but the pickles come out very well. 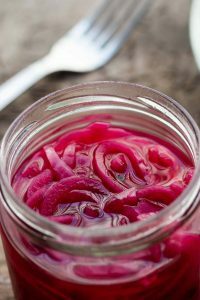 If you want a simpler recipe, check out my recipe for pickled red onions. 1. Make a brine with 3 cups (.75l) white vinegar, 1½ cups (300g) of sugar, cinnamon stick, a few cloves, allspice berries and peppercorns. Add 2 bay leaves and a small dried chili, then bring it all to a boil in a 4-quart non-reactive saucepan. 2. Simmer the onion rings, in three separate batches (that means, one-third of the onion rings at a time), for 20 seconds each (20 seconds for each batch) in the brine. Remove onions to a baking sheet using a slotted spoon to drain them, and let cool. 3. Then you do it again, simmer the onions in three separate batches, for 20 seconds each. Drain them, and cool. 5. Chill the brine thoroughly. Once chilled, add the onions and store in the refrigerator. What to do with the rest of your onions? Make one of my very favorite things–Three Onion & Three Cheese Pizza! P.S. You bought onions at the airport? Airport? I lugged back the onions in the Citroen. Still I had to schlep them around, back and forth. Interestingly, they were selling local onions and shallots at the tourism office in the tiny village I was staying in too! the city of Certaldo has the red onion on the town flag! It is a flatter onion. I am heading down to Calabria for the peperoncino festival and also to check out the red onions from Tropea, a torpedo shaped onion, fabulous raw. I also do pickles, can’t get good buns for hamburgers so just eat mine with meat! I do s simple version, salt the onions.. then put in a jar with boiled vinegar, with seasonings like yours…. good enough for me! 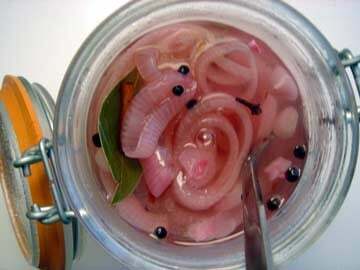 Did some cucumber pickles the other day like this with red onions. 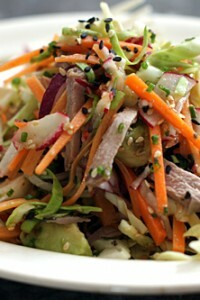 will send you the recipe if you like! Marcella Hazan in CLASSICS OF ITALIAN COOKING and Nigella Lawson in HOW TO EAT have recipes for a smothered onion sauce for long pasta. Nigella’s includes two melted anchovies per serving. Both are delicious and very autumnal. David, you can find hamburger buns at my local Monoprix! Try looking in the bread section of your Monoprix – they are usually with the scones and English muffins in ours. As for other ideas to use the onions – what about Nigel Slater’s Brie and Onion tart? It’s a puff pastry base with sautÃ©ed onions, thyme and slivers of Brie. Messy, gooey and absolutely heavenly! Make Sardines in Saor, a lovely cool venetian dish perfect for the summer. Hmmmm Aimee…those sardines do sound awfully tempting. And I love sardines! (perhaps I can get Brett, the sardine-man, to come and help me skin ’em. Make Balsamic onions! Peel the onion, semi-quarter it (ie cut into quarter but not all the way through the root end so that you end up with a loose onion blossom), pour balsamic vinegar over the onion and into the “center” of the blossom, wrap it in tin foil and bake for 45-60 minutes at 350. You get lovely carmelized onion pieces that are wonderful with salads, on sandwiches (esp with tomato and goat cheese), on your much-missed hamburger, or on their own. I used to get onions by the crateload at my job (don’t ask – it’s a long story) and this is a great way of cooking up large bunches of them. LOL, for some inane reason I wasn’t thinking about French onions when I asked about onions at the airport–so I was picturing you buying them in, like, Cleveland. For “les oignons roses” i won’t say anything if you sent me some. You’re so lucky you got these. One more thing : because of you I’ll have to buy another cookbook. Actually for the last few months all the reviews i got about the Zuni Cafe cookbook were excellent, but I don’t know, this book doesn’t sound appealing to me. But with this pickle you’ve changed the game.